Prince is a Blue Point Preferred Pattern Snowshoe male born in 2007. Prince was bred in the UK by Chris Thompson of Bitzaglitz Cattery. Chris is now the second longest active Snowshoe breeder in the UK. Prince is sired by the American bred Snowcats My Blue Heaven and his mother is Adfursh Brunnera. Prince has had a successful show career in the UK. 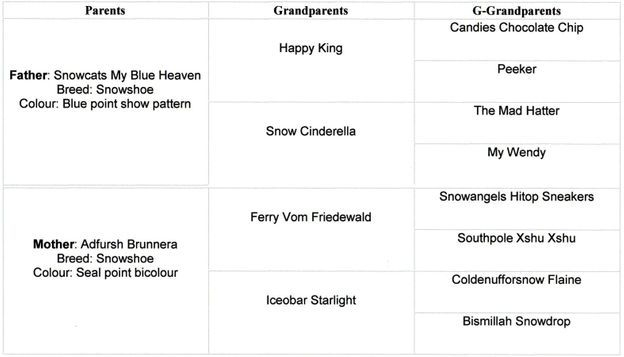 His pedigree represents the two most popular lines among the UK Snowshoes and remarkably contains zero inbreeding. 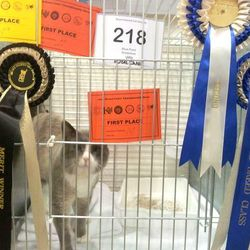 He has also been used to improve the UK Snowshoe bloodlines and his progeny include Destrier Snowstorm, who won Best of Breed at the 2012 Supreme Cat Show. We were lucky enough to be able to buy Prince and import him to Australia in August 2012 to help establish the Australian Snowshoe line. Prince is a medium size boy with a lovely nature. He’s like a little koala bear when he gives you hugs with heaps of purrs and much smooching. Special thanks to Kelly Cruse of Destrier Snowshoes for allowing us to have Prince.